Happpppy Sunday! I'm just getting this one in under the wire for the Altenew April Color Challenge and the Muse Card Challenge #213. To create this A2 card I began by running the front of the card through a dotted swiss embossing folder. 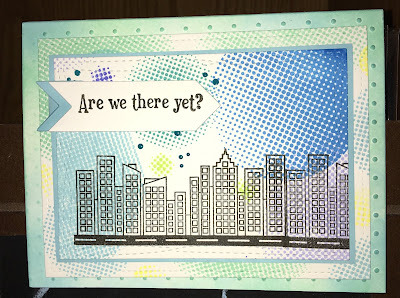 Next, I made a layer on cardstock with the Halftone Circles stamp in different distress ink colors - then I blotted some tumbled glass distress ink on some cardstock to created the blue layer; lastly, I stamped the buildings in black ink. I wasn't quite sure what I was going to do on this one, but I'm happy with the way it turned out. I'm still getting the hang of using the halftone circles stamps and they are really fun. I wanted the blues, greens and a bit of yellow. I stamped the sentiment and then handcut the little pennant with a bit of blue fishtail behind it. If I were to do this again, I would make it a 'less is more' kind of card but there you have it. I wish I could find a Madison, Wisconsin stamp, we've got such a pretty little lake line, but I might have to draw something like that. Beautiful card Mary! Elegante and modern. Great take on Kay's Muse card! Love, love, love the graphic novel feel of this with the outline buildings and the half-tone circles! Thanks for joining us at Muse this week! Amazing card! 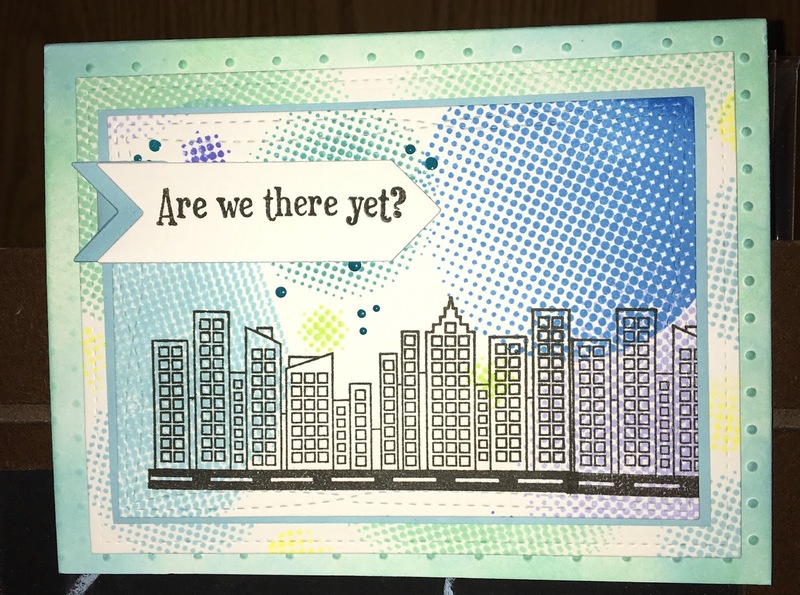 I like the way you used the halftone circles on this card. well done.